Email: Please find in my paper links or use the discussions at the bottom of the page. I am a Machine Learning Scientist in Amazon, working on general-purpose recommender systems. This is a precious and mostly harmless environment to practice statistical skills such as bias-variance trade-offs, optimal designs of experiments, causal reasoning, dynamic system modeling, etc. I was a PhD graduate from Machine Learning Department, Carnegie Mellon University. 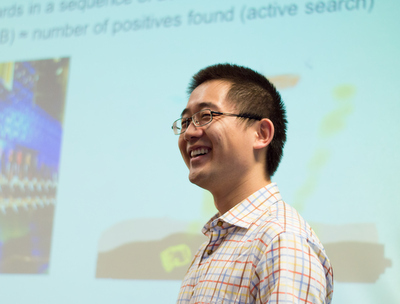 I work on active search, which is a set of algorithms that help users find all positive examples in an unknown environment by selecting queries and learning from their label feedback. Usually, the labels are costly. My research aims to use active search for complex tasks where the queries and rewards are not necessarily directly related. My work enabled many new applications in information discovery, social science, and robotics. While solving these problems, I also built theoretical insights using spectral graph theories, regret analysis, combinatorial optimization, information theory, and more. Concepts in interactive machine learning can help/has helped us better understand passive machine learning. Conversely, successes from passive learning can inspire active systems to handle more sophisticated applications. My hope is to bring the best of both worlds to build new applications. Guangyu Xia, Tongbo Huang, Yifei Ma, Roger B. Dannenberg, Christos Faloutsos. MidiFind: Similarity Search and Popularity Mining in Large MIDI Databases. CMMR 2013: 259-276. Yifei Ma, Dougal J. Sutherland, Roman Garnett, Jeff Schneider. Active Pointillistic Pattern Search. NIPS 2014 Workshop on Bayesian Optimization. Yifei Ma, Roman Garnett, Jeff Schneider. Submodularity in Batch Active Learning and Survey Problems on Gaussian Random Fields. NIPS 2012 Workshop on DISCML. Citadel LLC. Quantitative Researcher Intern. 5/2014-8/2014 at Chicago. Feature design and analysis for market value prediction. Bayesian methods for low-frequency predictions. Ph.D. Student in Machine Learning, Carnegie Mellon University, 8/2011-now. Advised by Research Professor Jeff Schneider. B.S. in Automation, Dual B.S. in Mathematics, Tsinghua University, 8/2007-7/2011. 1st GPA in Automation by the time of graduate school application. Totally 11 students dual majored in Mathematics in a class of 3000+ students. Exchange Study (Credits Transferred), Georgia Inst. of Technology, 8/2009-12/2009. A rare opportunity given to only 6 students university-wide. 10/2004, 1st prize in National High School Math Competition (over 2 years younger than most others). Volunteered for the 2008 Beijing Olympic Games (in medal ceremonies as a winning national flag raiser). Piano, swimming, running, and wall climbing.